As of this morning, Airport Madness Time Machine and Airport Madness 4 are both available for iPhone, as well as all other iOS devices. Until now, they were only available for iPad (and of course, PC, Mac, and Linux). We were initially reluctant to publish these applications for such a small device, due to the difficulty in selecting our tiny little airplanes. We have developed an effective workaround for this, and touchability is no longer an issue. I still prefer to play these games on iPad, but they look stunning on iPhone. I still plan to put these two games onto the Android platform. I’m not procrastinating (Well, ok, I’m procrastinating…). I am working on the Android version now. This entry was posted in Airport Madness: Time Machine, Airport Madness: World Edition on April 4, 2014 by admin. I’ve added more levels and more music to the free version of Airport Madness: Time Machine. I hope to see you all playing it on Facebook (and hopefully – rating it?). Be on the lookout for an update to the full version this week. Lots of bug fixes, new music, and the inclusion of a tool that recovers lost game data. This entry was posted in Airport Madness 5, Airport Madness: Time Machine on July 2, 2013 by admin. Airport Madness: Time Machine has just passed the 3.5 star rating on kongregate.com, one of the leading free flash game portals on the web. Gotta savor the small victories in life! Is 3.5 stars any good? Kongregate says “4.0” is the magic number. Once you break 4.0, you are something truly special. A 3.5 is good enough to get you featured in their Top Games section (although I didn’t see mine there – sad face). Hopefully achieving this benchmark will get the free version of this game found by portal owners. Fingers crossed as usual, for a viral flash game. We launched AMTM for iPad last week, and so far it’s done well. 5 star average (although that’s from only 4 votes 🙂 ). The free version will be in the app store some time next week, hopefully. I have high hopes for this game, as I do for all of my releases. 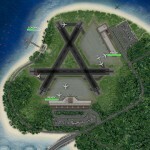 And believe it or not, the creative juices are already flowing for our next version – Airport Madness: World Edition. Start pelting me with your favorite real-world airport suggestions, please. This entry was posted in Airport Madness 5, Airport Madness 6, Airport Madness: Time Machine, Airport Madness: World Edition on June 26, 2013 by admin. I am pleased to offer you Airport Madness: Time Machine for iPad. This will be coming to Android devices soon, hopefully. One thing I’ve learned about mobile game development – make everything huge, especially buttons. This game doesn’t fit on smaller devices, such as the iPhone, unfortunately. The game has a lot of tiny details, and after testing it thoroughly on an iPhone 5, I just couldn’t bring myself to sell that to customers. This game does, however, look stunning on all versions of iPad. One tricky thing about selling on different markets is choosing a price. I remember paying $30 – $40 for a decent PC game 10 years ago. Nowadays, it’s hard to charge over $10. And on the app store, you are surrounded by hundreds of thousands of games, all just 99 cents – or even free. So how do I choose my prices? I sell niche games. There are not a great deal of ATC apps out there. They are difficult to sell, as not everyone has an interest in aviation. So I generally charge a bit more than one might expect to pay for a basic game. Obviously, it needs to be worth my time to make these apps or I would have stopped long ago. AMTM was one year of development, roughly 700 hours of coding, plus the cost of art, music, software and a decent web server. I owe my loyal customers a huge thank you for their continued interest and support over these past five years. I hope to keep doing this! This entry was posted in Airport Madness 5, Airport Madness: Time Machine, iOS Development on June 21, 2013 by admin. Allow me to apologize for not responding quickly to some people’s posts. It’s been a bit crazy around here lately, as it always is after a new game release. And it’s just me here. Indie Game Developer Extraordinaire. I have customer support on one screen, and raw game code on the other. Airport Madness: Time Machine has received plenty of feedback. I’ve heard the good and the bad. All of it via email, telephone, Twitter, Facebook, YouTube, and Kongregate. The people have spoken. The game is an experience. A journey. It’s worth the ten bucks. But it’s not quite Airport Madness 4. It’s my goal to get this game where it needs to be. Some find the process of working through 60 years long and painful. Some say that certain levels are painfully hard. Others painfully easy. I suspect that the levels are too long. They need to be shortened, from their current 4-minute duration, to about 2.5. The levels also need to be unlocked, so that users can jump to any year, any time they feel like it. These types of tweaks are easy for me. I just need to be pointed to where the game is boring, or where it feels impossible. Game duration and intensity are easy. With some minor changes, I can get this game above the ‘good’ mark. So please, shout out the feedback to me if you have it! This entry was posted in Airport Madness 5, Airport Madness: Time Machine on June 14, 2013 by admin. We’ve created a free version of our latest game, Airport Madness: Time Machine. Please rate the game. You can Play it here! It is always difficult to decide how much to give away for free. Give away too much, and you will have angry customers, who paid big money for the premium version. Give away too little, and you irritate a would-be customer. The free version gives customers an honest taste of the game. The years 1925 through 1935 are unlocked. So 11 free levels. Fifteen clams gets you the other 46 years. This entry was posted in Airport Madness 5, Airport Madness: Time Machine on June 8, 2013 by admin. We appreciate your feedback and support with this project, as with all of our games. We hope to deliver many more of such games in the years to come. This entry was posted in Airport Madness 5, Airport Madness: Time Machine on May 31, 2013 by admin. One of our users sent in this snapshot, demonstrating ‘how it’s done’ in Radar Chaos: Hawaii Edition. If memory serves, this would be the High North sector, with an extremely busy MAGGI arrival. I shouldn’t be posting ANYTHING in my blog right this moment, but instead focusing purely on tomorrow’s release of Airport Madness: Time Machine. I feel like a kid out late on a school night 🙂 Seriously, I am taking a one-hour hiatus from the code, then it’s straight back to work. Don’t stay up all night tonight hoping for an early release of AMTM, because it will likely not be until sometime tomorrow morning. The beta testers are beating me up pretty good with their bug finds! This entry was posted in Airport Madness 5, Airport Madness: Time Machine, Radar Chaos: Hawaii Edition on May 30, 2013 by admin. This entry was posted in Airport Madness 5, Airport Madness: Time Machine on May 25, 2013 by admin. I sincerely hope that we are not teasing you too much with news of our upcoming Airport Madness: Time Machine. I figure it’s best to keep our followers in the picture as much as possible, especially this close to our intended release date. Here is a ‘draft version’ of the game’s splash page. The final result will be slightly different, but this demonstrates the overall concept. We have finished the game, and are now in the testing phase. Believe me, the testers are finding plenty for us to do. In fact, I shouldn’t even be typing this blog post. I should be busy fixing bugs! Aside from the fix list, our 25 testers seem to like the game. We are thrilled! Right this moment, we are arguing over what music to use for background sound, and what should play during the splash image at the very beginning. Should it be loud? Or quiet, so that the airplanes can be heard? Music feedback has always been a mixed bag. Some say, “Don’t add any”. When we tried this with Radar Chaos: Hawaii Edition, some asked, “How come there is no music?”. I will try to post again early next week to keep you all up-to-speed on our progress!